1. Heat oil in a wok on medium-high heat, then add chilies and garlic. 2. Stir-fry them for about 20 seconds until fragrant. Toss in the chicken. 3. Stir-fry for 3-4 minutes until almost cooked. 4. Add a splash of water if chicken starts getting too dry. Add onions and peppers. 5. Stir-fry for another couple of minutes. Add oyster sauce, soy sauce, sugar, and finally a splash of dark soy sauce. 5. Keep stir-frying for about another 30 seconds. Squeeze in lemon/lime juice. 6. Grab a handful of basil, toss it into the pan, then fold it into the chicken. Immediately turn off the heat; basil really only needs to cook for a few seconds, and it will continue to wilt and cook from the latent heat of the chicken. ​7. Overcooking basil will make it chewy and less flavourful. 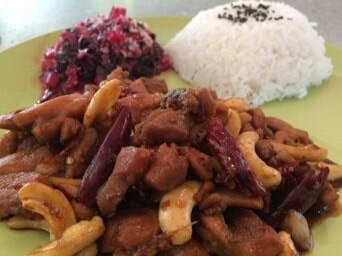 Garnish with roasted cashews and serve with Thai jasmine rice and half-fried eggs.